We’ve had fun with William “Grouchy Prince Billy” Patrick Corgan here at The A.V. Club over the years. 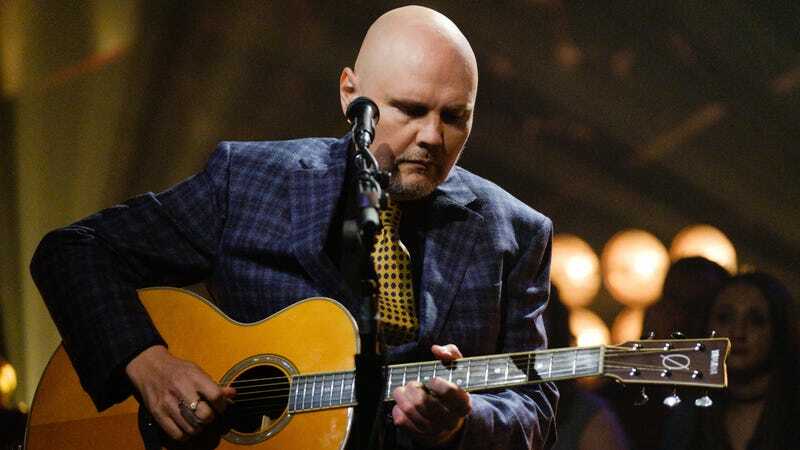 The Smashing Pumpkins singer has said and done some stupid things—especially when he bonded with Alex Jones—that made it easy to cast a skeptical eye in his direction. But we listened to the new Pumpkins song, and damn, it’s not bad. “Solara” is the first piece of new music we’ve heard from the reunited Pumpkins lineup of Corgan, guitarist James Iha, and drummer Jimmy Chamberlain since they announced they were getting the band back together, and it sounds very much like the group’s mid-’90s era of distorted power-chord anthems that made the band one of the biggest alterna-rock acts of the decade. (Read: None of Adore’s clunky electronica flourishes.) Corgan’s voice is getting stranger with age, but not necessarily in a bad way—there’s almost an element of Marianne Faithfull-esque warbly strain to it now, which isn’t exactly thunderous, but is markedly less nasal than his sneering heyday. The biggest takeaway from “Solara,” I’d argue, is that Corgan’s music is profoundly better when he has Chamberlain providing the beat. The drummer is seriously underrated, and on this track it sounds like he’s making up for lost time, delivering fills that could pass for Neil Peart in terms of busyness. It’s unexpected, but were it not for the changes in Corgan’s voice, this could pass for something off of Mellon Collie And The Infinite Sadness, which presumably either sells you on it or gives you a shudder of revulsion. Either way, tickets are on sale now for the “Shiny And Oh So Bright” tour. We’ll go ahead and guess that ex-bassist D’arcy Wretsky will not be attending any of the dates.